Hello experts! i am a newbie grower from Philippines! 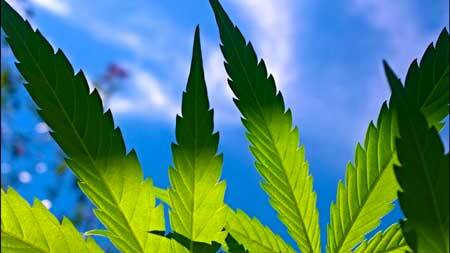 i've been growing cannabis plants for awhile. I'm currently growing my 3rd plant. My first and 2nd was failed. I'm a little bit frustrated right now! Please help me diagnose my sick plant. I really need help. I've been researching and watching useful information all the time. But i can't find the answer to my problem. and then it's starts to have a dark greyish spots with some rust on serrated edge of the leaf with some yellowing it's starting to spread out at the bottom. I'm not sure if it's deficiency or a pest because i've notice a very tiny crawling at the top of the leaf(color brown) i'm not sure what it was but it is not spider mites. I also tried flushing my plant several times with clean ph water ( i'm using tap water) but it doesn't do anything. leaves keeps dying. I am growing in a 4x4 grow tent set up with a 6 inches exhaust and intake booster fan with 12 inches oscillating fan. i post some photos and link pls take a look and somebody tell me what the F*** was wrong with my plant lol. the top plant looks ok but underneath looks ugly. what is it? what's wrong? what do you think guys? is it root rot or what? I'm planning to use neem oil soon for extra precaution. Pls help me masters! peace! I like big buds and I can not lie. Your plant overall looks great. Have you been checking the pH of the water that's coming out the bottom? It reminds me a bit of a Phosphorus deficiency, which can be caused by incorrect pH. Even if you're putting water in at the correct pH, if it comes out too high or too low you know something is wrong. In coco you're looking for a pH between 5.5-6.5. It's also pretty hot and humid in there. A vegetative plant may still grow well, but the humidity and temperature is something you want to address before the plant starts flowering (making buds). Plants are much more sensitive to their environment in the flowering stage. However, if the symptoms are on just a few leaves at the bottom, I wouldn't worry too much. Especially if it's only happening to the leaves that aren't getting light anymore. When the leaves stop getting light, the plant often sort of "abandons" them after a while in order to "focus" on all the new growth that's getting light. When you look at the whole plant from above, it looks almost picture perfect, great job so far! Thank you so much my friend.i will check my run off ph after i water again. Noted on that. I've notice a few spots on the mid top of the leaves already. Hopefully i can get an ac as soon as posibble. If i get the wrong ph at the bottom do i need to flushed my plant again until i get the correct ph right? I will update on this grow journal. Hopefully you can still guide me in the process. If the pH is coming out too low, give it to them high and vice versa. But you usually don't need to flush with such a pretty plant. So in coco you want the pH to be 5.5-6.5. If it's coming out lower than that, give water at 6.5 every time you regularly water until it starts coming out normally, and if it's coming out high give 5.5 pH every time until the runoff water is in the right range. thank you again! that make sense! big help! just to give an update to my plant. So here's what happen in the past weeks. You're right i have a PH problem in my medium. (also the ppm was to high that what i put in, about 1000 plus ppm) my ppm every water is about 800+. I decided to flushed with clean PH water b'coz i assume maybe i have a nutrient lock out? Today i water with yellow PH at 6.0 and got a run off orange PH (5.0) ppm around 600+. Let me know your suggestions and Tips. Should i worried? but the plant looks great and bushier right now. im a bit confuse of the right range of PH for coco- soilless mediums i believe it's 5.5 to 6.5 right? I've read an article from 420magazine regarding phosphorus deficiency. It say's phosphorus absorbed best in hydro/soilless mediums (like coco) at ph levels of 4.0 to 5.8 (4.0? Isnt that too acidic??) and best range of ph levels of 5.0-6.0 but they mention that phosphorus gets lock out of ph level of 6.0-8.5(how come he mentioned best range of 6.0 when there's a tendency of phosphorus lock out of 6.0. That's confusing. 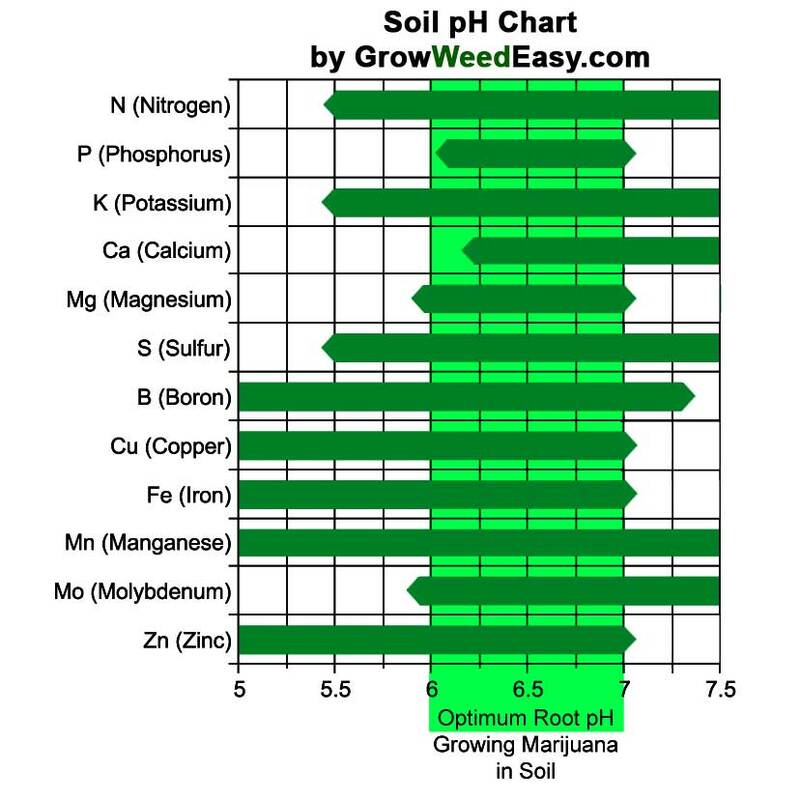 Different nutrients are available at different pH ranges. 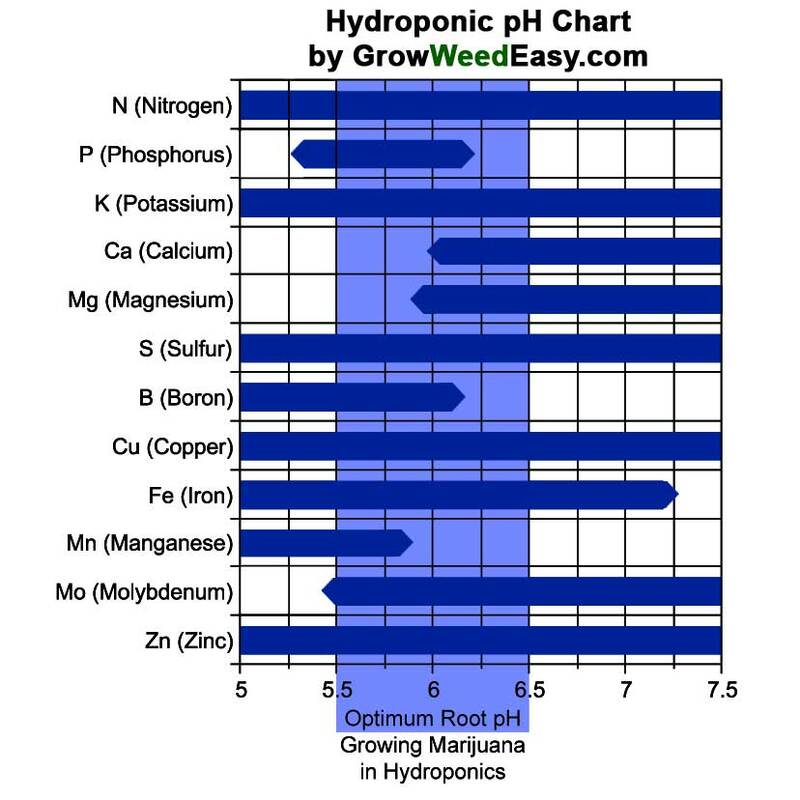 The below charts show how doing 5.5-6.5 with coco/hydro/soilless and 6-7 with soil gives your plant access to the most nutrients. If you go under 5.5 in coco you often start getting Calcium and Magnesium deficiencies, for example, but if the pH is higher than 6.5 you can lock out Phosphorus, Boron and Manganese. That's why 5.5-6.5 is recommended. It's also recommended to let the pH range over time, so sometimes it's closer to the higher end of the range, and sometimes it's closer to the bottom. That helps ensure all nutrients get absorbed. I hope that helps! Wow thank you this charts is very helpful! My plant is doing good so far but some spots are still showing. almost 1 week from 12/12 light cycle. i should have switch this when she's 8 weeks old before she got stressed. it takes 2 weeks before she recover. Happy New year! It's been a while since i visit this site. just want to share some updates on my plant and i'm lucky that my plant is female. She's looking good right now very tall maybe 3 1/2 feet tall i think she's done stretching. used calmag for 2 weeks but it seems nothing's changed. Also buds are small or maybe she will get bigger after few more weeks. I'm using kool bloom for pk booster as an additives. My temp at night is around 25 to 29c when the lights is on, 30 to 33c during the day lights off. I managed to get an AC but i don't use it 24/7 only when the lights on(I'm afraid to see my electric bill lol). Advice and tips are very much appreciated.